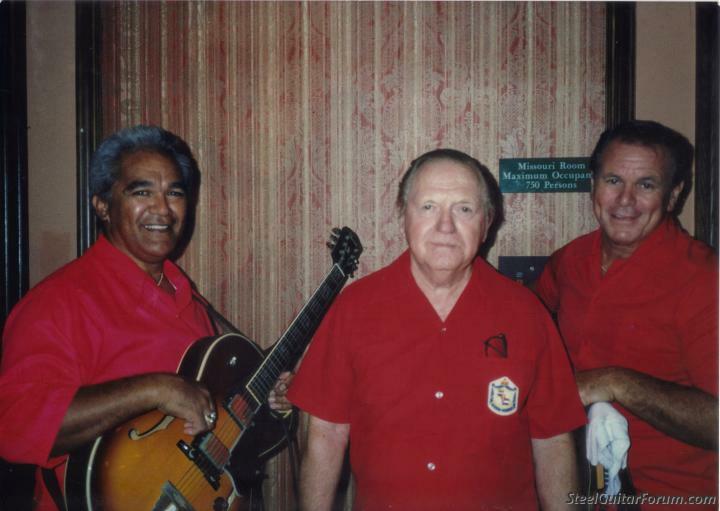 Here is the first installment of cassette recordings I made of Jerry and his trio at the Halekaulani hotel in Waikiki in probably 1985 or '86 on Scotty's Jerry Byrd tour. The master at work! Excuse that nasty cold I had. Can't wait to hear this or say thanx enuf. That's the exemplary band who eventually walked away from this venue when they refused Jerry's request for a 3% increase from what was pauper wages. YW Jean-Sebastien. No BSing on the A/B pedals 'till the next Idea comes along here! Jerry Byrd all time best steel player. Wow! New Zealand. Great. YW!! That's Scotty and Mary and others that you hear from time to time. It*s fantastic to find some concert recordings here! Mahalo nui loa for sharing this rare sound documents. Is there a complete/bundled download of all the files available? Maybe as a ZIP archive? I think there is an error in you link, their is 2 number 5 and no 6. Just gotta bump this one. The mood of these recording is totally "where its at." As with Ian, (and many others no doubt), these cuts brought back many fond memories of the time I also spent with these guys. Kalani was always so gracious to my (late) wife Mary. Each year as we walked into the "House Without a Key", Kalani would say, "Welcome home Keoki and Malia !" He passed away far too early in life. Kalani was a fine vocalist and bass player ! Can't thank you enough for sharing these amazing recordings. We often focus on Jerry the soloist, but these performances highlight his ability to support the song with his background playing which he also really shines at. The range of his repertoire and style is pretty mind boggling. Hiram's rhythm work and the vocals are outstanding as well. Just a top notch band. YW and Yes, what a group! Posted 15 Feb 2014 7:26 pm Beautiful memories !! Chris , Thanks so much for making all that beautiful Byrd music available !! My wife and I went to Hawaii with Scottys group in May ,1983 and Jerrys trio was playing at the "Pink Palace". Great memories, but Jerry was playing right in front of the kitchen and you could hear all the dishes rattling !! I don't know how Jerry could stand all the distraction noise but it didn't seem to bother him !! Thanks again !! olde geeze - AKA Eddie "C"
I was just a youngster and somewhat new, But Scotty, and Mary Margie Mays and the rest sure knew! Was this a one time event or did Jerry Byrd & company play this nightly? This is so beautiful I can't stop listening, I love where he says write your requests on a napkin,he also had a nice sense of humor. The Jerry Byrd Trio had a long run at the Hw/oAK into the 80s, until he asked Mgt. to give his guys a meager 3% pay raise from the peanut shells they were getting for top shelf musicians. The hotel said no, and that was the end of a beautiful thing, and it just got worse for decades until Kanoe came back from surgery recently to hula and demanded the Hiram Olsen Trio be reinstated as her backing, at full pay. I stumbled across this small free Media player that totally enhances these recordings. The Enhance plugin has lots of presets, but the one that sounds so sweet is the outdoor ambiance, It sounds just like you are there watching and most of all really brings out Jerry's playing. The player and plugin are less than 5 mb total. Here are the links. The Enhance plugin is for WinAmp but if you install to the Aimp2 folder it works just fine.